Tim Myers is a writer, songwriter, storyteller, and lecturer at Santa Clara University in Silicon Valley. His children’s books have won recognition from the New York Times, NPR, The Smithsonian, Nickelodeon, and many others. He’s published over 100 poems, won a prize in a poetry contest judged by John Updike, won a major prize in science fiction, has been nominated for a Pushcart for an essay, and has published much other fiction and non-fiction. These poems begin as an examination of tongues and other body parts but expand to become an examination of nature and the humanity that helps make up what we call "nature." 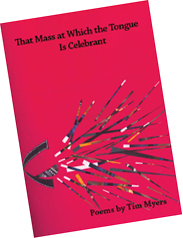 Tim Myers's poems are fascinating in the questions they pose and the challenge they offer the reader to answer in a clear, precise poetic vocabulary. went flying into the stands. his little girl, instantly, thoughtlessly. in utter joy and abandon. before we could make a plough—a book—a school? as if voices in my own ears, tonight. of our child are forming.